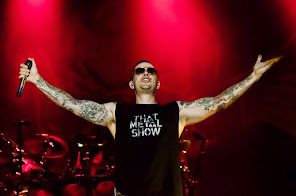 Avenged Sevenfold News: M.Shadows: "The strangest request from a fan..."
M.Shadows: "The strangest request from a fan..."
3. Strangest request or question you ever received from a fan. A guy brought his 15 year old daughter and wanted us to sign her arm so she could get our names tattoo’d on her. I don’t know why he would ok that, the last thing she needs is a bunch of signatures from some dirty Rock Stars.